What Is The Best Simple Coffee Maker? Making freshly brewed coffee is pretty awesome, I think we can agree on that. But it can also be a hassle, and spending 15 minutes in the mornings fiddling with dials on espresso machines isn’t everyone’s idea of fun. So what’s the best simple coffee maker? Well, for me the answer comes down to whether you’re willing to pay a premium for a quality automatic coffee maker that will take care of the whole shebang, I rated the Technivorm Moccamaster as the best SCAA-certified coffee maker around at the moment and it’s worth every penny. If you’re looking for something on the cheaper end, then a French Press is the way to go. Here’s a model from Bodum that is known for its stability and practicality and is an all-round good bet. If you like the sound of either of those, well, here’s the Amazon link to the autodrip coffee maker Tehcnivorm Moccamaster and in here you’ll find the link to my favored brand of French Press’s. You’ll find the specific pricing info and reviews and everything in there, of course. What’s The Best All-Round Simple Coffee Maker? If simplicity is your desire, then an automatic coffee maker is the way to go. And I’m not talking about the cheap plastic hunk o’ junk sitting in your parents’ kitchen, there are automatic drip coffee makers available these days that can brew coffee with the best of them. The gold standard you are looking for is something called ‘SCAA Certification’. 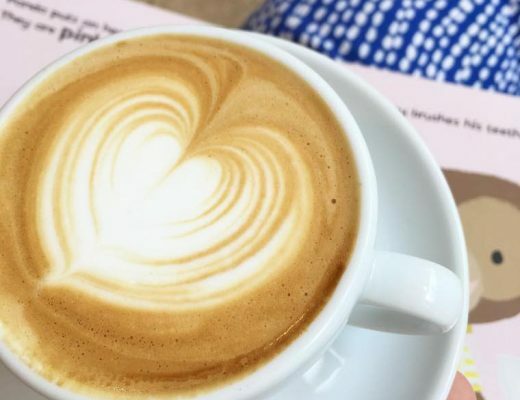 Coffee makers that attain this designation, and there are not many, have been judged by the SCAA (Specialty Coffee Association of America) to meet all the criteria to be able to make excellent coffee. 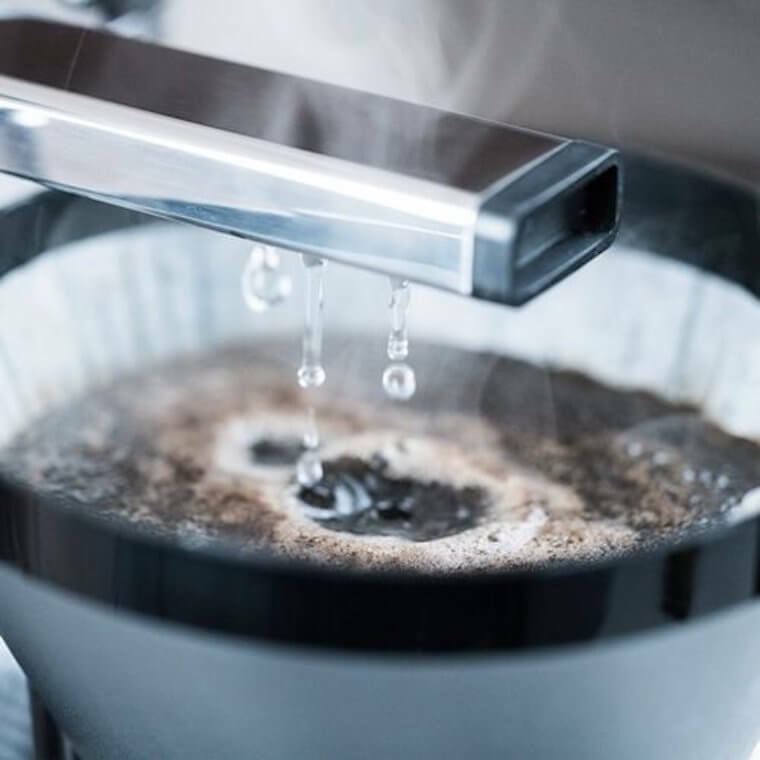 Coffee makers that aren’t SCAA certified come with problems like irregular water temperatures or poor drip distribution, little things that ruin coffee. 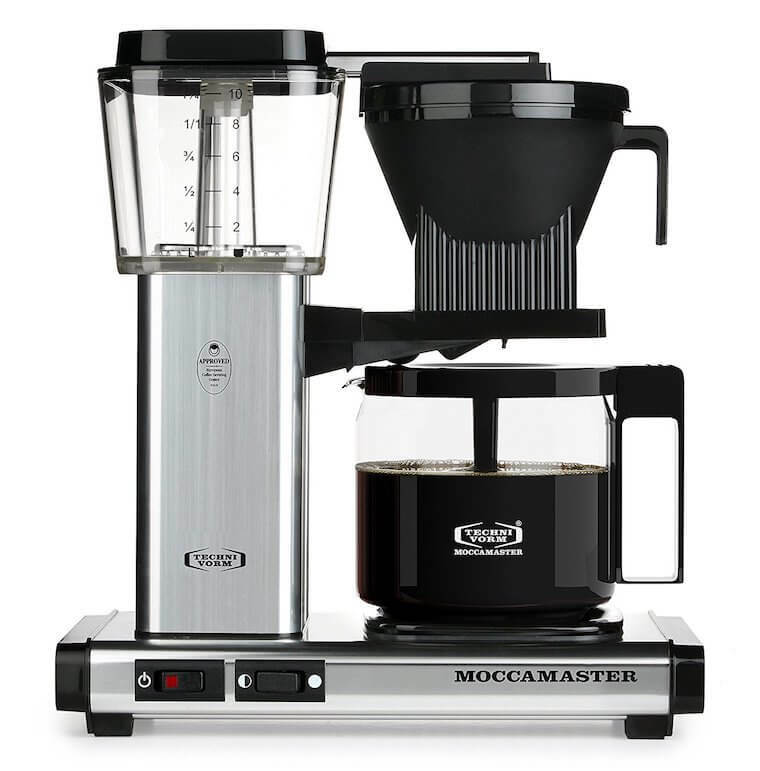 Here’s the model that I ranked as number one in my roundup of the best SCAA certified autodrip coffee makers, the Technivorm Moccamaster. As well as having a glorious design and a quality that is built to last, the Technivorm is backed up with a 5-year warranty. And that SCAA certification means you know it will hit all the notes for making top quality coffee with none of the hassle. Here’s a closer look at the fountainhead which is where the water comes out. You’ll see that the dripping of the water is all automated, no need to stick around while the coffee is doing its brewing thing. Here’s a look at the buttons on the bottom of the Technivorm. As I mentioned, you simply put your coffee and water in, hit the switch and come back to freshly brewed coffee. It will be kept in the carafe below which can also be heated to keep the coffee hot. Check it out on Amazon (and see the latest pricing info) here. What’s The Best Cheap Simple Coffee Maker? If you’re looking for a simple coffee maker at a cheaper price point then I’d like to introduce the French Press. I feel like this method is much aligned, in part due to its simplicity. After all, how can a pot with a plunger really make great coffee? 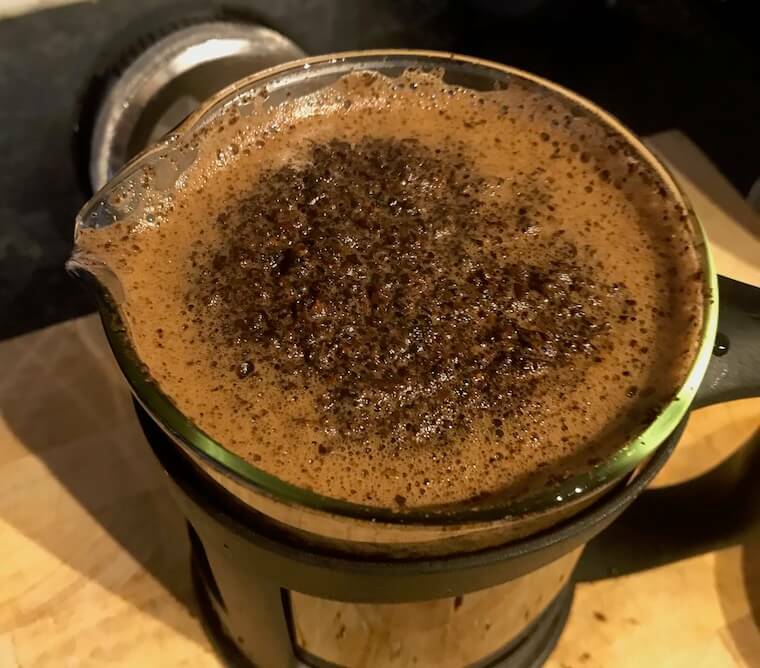 The truth is, the French Press not only is capable of making fantastic coffee up there with the latest gadgets of coffee’s Third Wave, but it has a taste profile all of its own that keeps many coffee aficionados (myself included) using it on a regular basis. 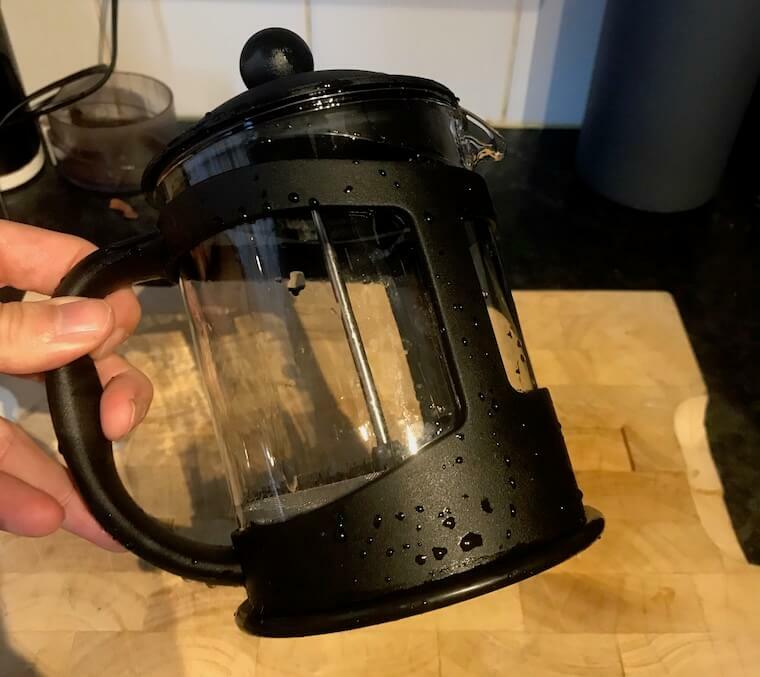 The French Press uses a metal mesh plunger which has relatively larges holes and allows much of the thicker coffee oils and microparticulates to pass through into the cup. This results in a little sediment at the bottom of your coffee, but also means the texture of the coffee itself is rich and full. 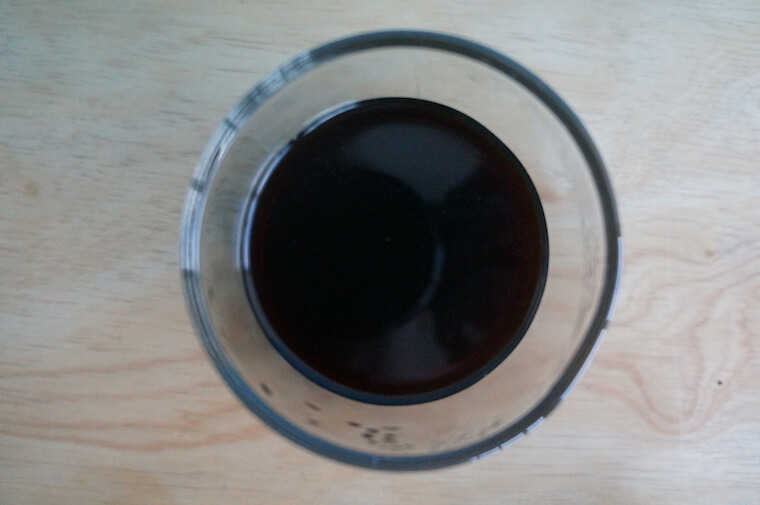 In the coffee world, we refer to this deep taste as being ‘full-bodied’ and is really noticeable when you taste it in comparison to something like a drip coffee that uses a paper filter. Now hopefully you’re liking the sound of this French Press ‘shtick’, well the best bit is that it’s super simple to make. Throw your ground coffee in the pot, add hot water and wait 3-4 mins then plunge it and pour yourself a cup. See? You can learn how to brew it in one sentence. Now that’s simple. Personally, I recommend Bodum as far as French Press brands go because they’ve been around a long time and are well-built and reliable. You can check them out on Amazon, I’d go with the Bodum Brazil. It’s the most popular one they do and hits all the bases. Here’s the one I have which is a Bodum Kenya which is a little harder to find although fulfills the same function. Here’s another shot to show you what a French PRess looks like when you open it up. As you can see, it’s super simple. There’s the pot where you mix up the coffee and water and the plunger which you push down at the end. And for good measure, here’s a shot of the pretty brown “crust” you get during the brew. Make sure you give it a stir to get a more even extraction! Actually, in terms of what French Press you buy, it doesn’t really matter. They are all much of a muchness. Although I do like the look of this one, it’s by Frieling and is all stainless steel and it supposedly retains the heat better than the standard borosilicate glass French Press’s. It’s a little more expensive though. 1. Buy preground. I’ve discussed my somewhat controversial viewpoint on grinding coffee vs preground in this longer article, so I’ll keep it short here. Preground coffee is not that bad if you’re in the beginner stages of coffee making. It doesn’t require you to own a grinder which if you want one that’s worthy of the task is going to cost $100+ and means you will get a consistent grind size as it’s made by the (presumably) excellent grinders at your local coffee shop. It has the added bonus of being extra simple when brewing coffee. If you’re using an autodrip coffee maker, place your filter in, put the preground coffee into the filter and you’re good to go. Not spending a couple of minutes rotating your arm around making your coffee beans grind into small chunks! 2. Use an electric kettle. Firstly, you can ignore this point if you’re using an all-in-one coffee maker like the Etchnivorm I recommended. But if you’re brewing with a French Press or something else, you need a way to get that water heated, and heating on the stove requires more work and more time than just having a kettle that plugs into the wall. 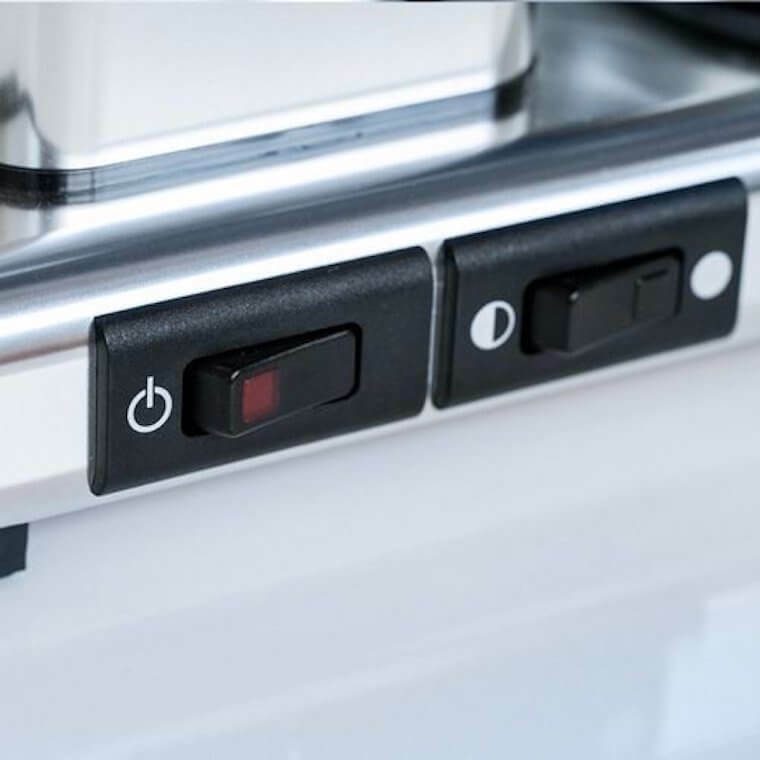 Flip a switch and come back in a minute or two to your water, perfectly boiled. If you wanna go all in and get yourself a specialty gooseneck kettle that is made for coffee then have a look at the article I wrote on the best ones available. The first one is pretty special, I gotta say. 3. Get a coffee bean subscription. I’ve said before and I’ll say again that probably the number one way to upgrade your coffee making at home is to buy freshly roasted coffee. The big secret that coffee shops never tell you is that most coffee they sell is stale. It’s still drinkable, just past its best. 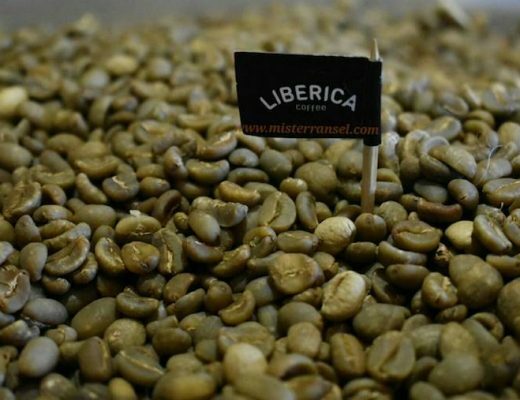 So if you start buying coffee beans from somewhere reputable you can take the coffee you drink to another level, the key is to look for a roast date on the bag. Now, to marry that little idea to simplicity, you can find some awesome coffee roasters online who will send you freshly roasted coffee on a subscription, so you never have to worry about running out and making a late night trip to the grocery store so you get your morning brew the day after. You can check out my article here on some of the best ones around or even just do a Google search. I think brewing your own coffee gets a deserved reputation of being a bit finicky and time-consuming. It’s absolutely true that if you pick the wrong brewing method that your morning coffee might take 15-20 minutes all included, and that just leads to money spent on average tasting Starbucks picked up on the way to work because it’s quicker. So here’s a few methods you absolutely not need to go anywhere near if you value simplicity in your coffee making. And there’s one or two in there that might surprise you! 1. Espresso. This will seem like an obvious choice to anyone who’s played around with an espresso machine but… if you’re after simple, don’t get an espresso machine. To pull decent espresso requires a working knowledge of grind size and consistency, temperature, pressure, tamping and so much else that makes it a big no-no when it comes to simplicity. 2. Pour Over. This method of making coffee is deceptive, it looks so easy! All you do is pour your water over the coffee grounds and it happily collects in your cup at the bottom. The truth is, there’s a lot more going on than you may realize. The first point is that Pour Over needs to be watched throughout the brewing process, you need to be constantly pouring in a continuous or at least pulse pour pattern. Then you have to worry about channeling, where the coffee grounds that are dry and clump together don’t have any water passing through them. There’s also grounds that stick to the side of the filter which also don’t extract. In short, there’s a lot more that can go wrong with Pour Over than meets the eye. This includes pretty much every Pour Over coffee maker you can think of, such as the Chemex, Hario V60, the Kalita Wave and so on. 3. Aeropress. 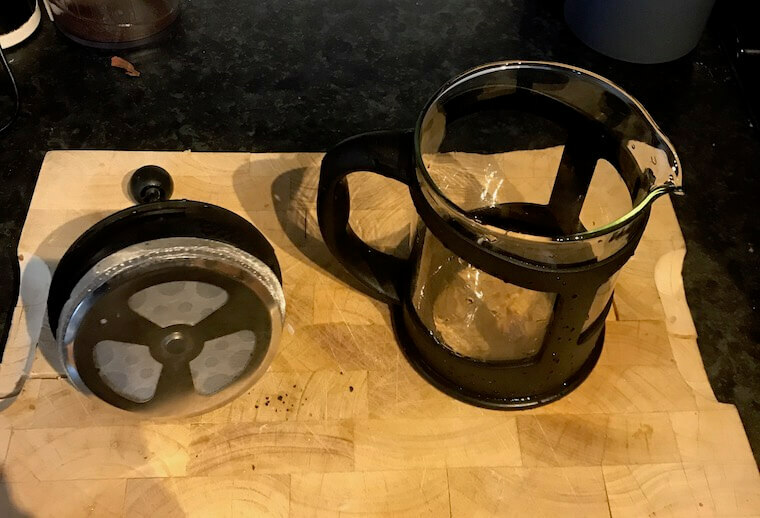 This modern little device gets recommended to everyone, and with good reason, it’s an awesome way to make coffee and is a real treat for anyone who’s used to getting average tasting brown stuff from decrepit old coffee makers. The thing is, the Aeropress ain’t that simple. The Aeropress itself is made of three parts and you get another 4-5 little knick-knacks included, half of which you don’t really need. (Yes, I have done that before). So I still will recommend the Aeropress, but only to those who are willing to take a little time to learn the ins and outs of this cool little coffee maker. Not for those after something simple. If you’re a “only got 30 seconds max to make coffee” kinda guy or gal, then even using the most convenient autodrip machine or a french press might be a little too much hassle. After all, you’re still brewing coffee, it takes time. The alternative option you have is to try instant coffee. 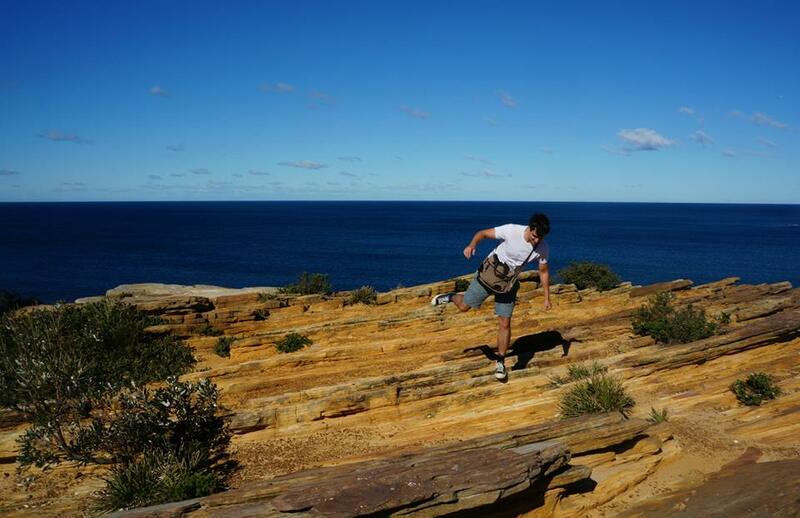 I know, I know, it’s freeze-dried rubbish that tastes nothing like the real stuff. Well, you might be surprised to find that there are some quite bearable instant coffees that will give you a satisfying cup in the morning. And it will take mere seconds to brew, as you’re just reheating freeze-dried coffee, and require zero knowhow whatsoever. While I’m not saying they are going to compete with a well-made brew from freshly roasted and ground coffee, they won’t be a million miles away. Anyway, I wrote up everything in my article on the best instant coffees which you can check out here. If ‘simple’ is your goal then nothing will beat a quality autodrip coffee maker. 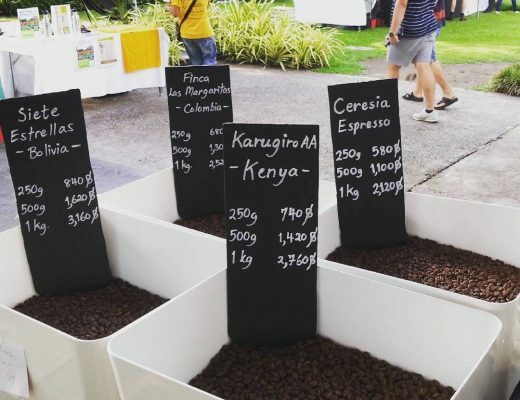 The one I recommended in this article is great but there are other ones that will do the job, just make sure you get yourself on that has its SCAA certification or you’ve got no reliability when it comes to the quality of your coffee. If you want simple on the cheap then look no further than the French Press. It’s small, durable and easy to learn and is more than capable of producing top-tier coffee with far less effort than something like a Pour Over or Aeropress. Did I leave anything out? Please comment below, I’ll try to reply to every one!